Nope, no smell at all. People actually comment on how good they always smell! Because you are evaporating the sweat, there is no bacteria sitting in the fabric. It’s awesome! Brandon has been doing this for years and years. He has gis 8 years old that look brand new! Soak [your new gi] in white vinegar to set the color: kitchen sink, fill with cold water, add 2 cups white vinegar, soak 30 minutes, wash as normal… voila! I will definitely be trying this trick when my new Break Point Light Weight women’s gi arrives. Cheers, Michelle, for taking the time to share your domestic sorcery with us! I know, as it comes up with the opposite conclusion that it might be interpreted as a slam of some sort, and that was NOT my intent. I love this sport and everyone who loves it too, and I only write from the spirit of genuinely wanting to foster knowledge and understanding and safety. Big thanks to Georgette for going deeper into this issue and providing us with a more informed opinion than any of us non-experts may have. Big thanks again, too, to Michelle and Brandon who shared their approach with us; it ain’t easy putting yourself into public view! (1) I haven’t tried this approach as I don’t have a dyer, so I can’t personally vouch for its efficacy or its safety for your gi. Michelle, however swears by it, and I’m passing on the tip for your information. Use at your own risk! Just think of the damage to the environment though! Knowing, as I do, your penchant for sarcasm, not sure if you are being on the level or a wind up merchant, Tartovski. I had considered this, but assumed, blindly with no research to back it up, that a 10 minute very low heat drying cycle consumes less energy than an hour’s washing (electric for 10 minutes versus electric for 60 minutes + water + water treatment). Kinda seemed logical to assume that a quick blast in the dryer was more efficient. Certainly in my case, I occasionally have to wash a gi at 90 to get the bacteria/funky smell out and normally wash on 60 to prevent said bacterial build up and funk. If I had a dryer could drastically reduce those energy costs. Sorry, I read that half asleep this morning – missed the only 10 min bit. I’ve tumbled a Gi from wet before, when in a hurry, and it takes AGES – which is why I said about the environmental impact. Actually, the 10min dry might be an option. That said, I have no idea if that’s even possible on my dryer. Let us know if it works well for you. If those people trained at my gym, I wouldn’t touch their gi. It takes soap and water to clean things. This horrifies me. I train regularly with “those people” and I can attest that Brandon’s gi always seems clean. None that I recall have that “bjj funk” smell, etc. Will do Anna, a club mate is trying it this week. Best wishes for a swift recovery so you can rock that gi! Please don’t try it 🙁 Better to be really clean than to have a pristine black gi!!! I too am skeptical…. If just drying cleaned clothes why haven’t appliance manufacturers gone that route and pushed for dryer sales since they now do the work of two machines (washer and dryer) and make washers obsolete like any other useless piece of equipment. And if it really works for gis, it should work for kids sports uniforms or any other clothing (also bed sheets, towels, etc) to that matter. Has anyone compared the temperature the dryer reaches with the temp needed to kill the bacteria etc? I imagine this could work but my preconceived notions tend to tell me it wouldn’t be hot enough. Hi Jessica! As stated, no research or qualifications here – HAHA – just reportage 😉 You’re absolutely spot on, this would be valuable info and lucky for us Steph has looked into this https://megjitsu.com/how-to-wash-bjj-gi-without-water/#comment-1004. Oooo, perhaps tweaking the directions per machine is required? Thanks for the update, Seymour! I would think the smell-rationale here is more towards the sweat. The smell isn’t produced from the sweat but from the bacteria that feeds off of it. If you get rid of the sweat, there’s nothing for the bacteria to feed off. Just thinking about other people’s skin (another prime food source for bacteria), hair and sweat as well as stuff picked up from the tatami, I wouldn’t really feel comfortable with a ‘dried’ gi used more than twice without a proper wash.
Hi André, thanks for reading. Agreed, the smell-test is certainly linked to the sweat and associated bacteria. Your concerns are shared by readers and I suppose the only way we’ll know more is to plan proper experiments with proper controls and take gi to the lab for comparison. If anyone manages this, results would be eagerly received! Is the dryer sheet truly necessary? First, I really hate the smell of them and don’t want to subject someone else on the mat who may also hate the scent to the smell. It seems equivalent to wearing perfume. Second, it seems to be an unnecessary exposure to nasty chemicals. I don’t want my gi coated with that stuff. Finally, while I can see the heat killing bacteria, I don’t see how this handles any skin/hair oil. Thoughts? Hi GOPLawyer, I’m also a real phobe about perfumes in my washing and use unscented products and have never used dryer sheets (though I have not had a dryer for the many years I’ve lived in the UK); I’ve got sensitive skin and the perfumes can be a problem. At any rate, in terms of this methodology I suppose that the dryer sheet is a matter of personal preference rather than a requirement. Final conclusion: took about 35-40 minutes to dry the trousers and main gi jacket fabric but not the collar. It smelled nice but it’s a bit of a hassle and I reckon an hour would have dried it completely [- negating the enviro benefits imo. Plus washing is the only real way to rid my gi of all detritus. Fun experimenting though. Wow. It took that long? What kind of Gi do you wear? At most Ive gone maybe 25 min. That normally takes care of my gi pants, jacket and the jacket collar after a heavy training session. As stated in the article Ive been doing this for years. The only gi’s that I didnt do this with were my 1st couple of Gi’s ( a Krugans kimono and an Gracie Academy gi that I bought when I was a white belt) and any White Gi’s I own as they show dirt and mat yuck after class. I currently wear Machado kimonos Palladium Weave (which does take longer than 10min) , Vulkan Ultra light (10 min) and a Helio Soneca Team gi made by Subculture gi’s (10-15 min). Now my brother in law is a super sweat factory and If you are like him……you will need to wash it after class. HAHA! ‘super sweat factory’, good one. I think I might be one of those! Thanks for your thoughts, Brandon. I’m definitely going to give this a try to get rid of any funk-undertones I’ve got going on. Thanks for the mention! You should totally ask your microbiologist friend about this too, Megan: I’d be interested to hear the professional opinion. The only time I ever put my gi in the drier is if I’m looking to shrink it (and at my parents’ house, seeing as I don’t have on at home ;p). Still, interesting concept. I agree! Would you ask your microbiologist friend? Alas, I have no dryer, so I will have to forgo testing. So how did the smell test go for you Meg? Great piece, Georgette, thanks for creating it! This has been an interesting series of articles. I love it. Yeah–I’ll continue washing the gi, and thankfully now I can line dry it rather than just hang it in my apartment (my new apartment has roof access! Woot!). Thanks for your comment, Julia. That *is* good news about line drying. That’s the only way I can dry – well outside in the dry weather and on clothes hangers and radiator racks during the colder wetter months – and it has definitely been kinder on all my clothes; haven’t had a dryer since moving to the UK in ’98 and much prefer it now for the most part. I do find that if gi stay too long in very hot sun they can get very coarse, never to be softened again, so you might want to watch that. 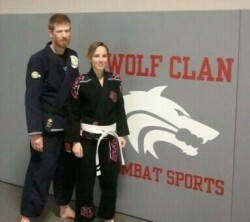 I’m 2 weeks into this gi bjj business & it’s more fun than the grueling thought of running. Washing gi is not so much fun! I will def. try this tip & let you know if others can “tell” this method of washing. I’ll be back to read your blog & gi reviews. Thanks for your time and talent! 30 minute till class time, I better get going! Thanks for reading and commenting and enjoy your training! I’m assuming it’s a great troll, geared towards making people re-think their hygiene. However, black-belt or not, that’s a nasty habit I must say. I’ve been in this BJJ thing for about 15years now… and I think one of the critical aspects of a safe practice is to care about you partners. And hygiene comes into this again. The only thing that kinda works is to leave your gi in the sun, as uv rays will zap most bacteria… but still, those gis are like mops, moping up who knows what. How many times have I done a class after a kick-boxing class? Anyway… there should be no short cuts to kimono washing for BJJ practitioners. This “tumble dry” thing can work for Aikido or other arts, but not something so vigorous as BJJ. To all those reading this…do not do this. Dryers, even on a low setting, can damage the rubber that’s in the collar of your gi jacket. Also, it may not be noticeable the first one or two times you do this, but every time you put your gi in the dryer, even just for 10 minutes, it shrinks–little by little. And last but not least, there is definitely a smell. You know what it smells like? BAKED BODY ODOR. It’s disgusting. This comes from my own personal experience and rolling with jiu-jitsokas who practice this “tumble clean” method. This is complete bologna. Hi Stephen, thanks very much for weighing in with your comment!